As the world has shifted to social media, more consumers today are looking to fellow consumers to inform their purchasing decisions. Marketers have since recognized the power of digital creators and influencers as brand advocates to reach new audiences, grow their awareness and brand affinity, and build buzz around their products. Where marketers once had to choose between the direct revenue with affiliate marketing or the brand awareness with influencer marketing, many are now seeking new ways to integrate both methods to reach wider audiences while simultaneously driving sales. They have started to realize that influencers can be more than just powerful brand advocates — they can deliver sales and measurable results. While many marketers have relied more heavily on influencers to build brand awareness, driving sales is usually front and center. But many marketers have been unable to accurately measure influence and how it translates to sales, often relying on unrealistic metrics such as social media impresssions and likes. With influencer marketing, there is power in numbers — the ability to advocate a brand or product to audiences at scale. When consumers hear about a product promoted by an influencer across their social media, along with a link directly to the product page, it moves potential customers closer to a purchase decision. And tracking those sales is critical to any business in measuring their ROIs. With Snips Social Market, brands can now take advantage of both brand advocacy and direct sales in a single influencer campaign, building greater long-term value. Beyond simply word-of-mouth advertising, Social Market provides marketers with the ability to track and measure the emotional connecting between influencers and their audiences — from the point of engagement with fans across social media, all the way through a conversion, sale, or signup. Instead of counting impressions on social media, you will be counting sales from recurring customers. Brands and marketers can finally rest assured they are paying for real, quantifiable results — and that means better ROIs and greater transparency. Social Market campaigns allow influencers to promote any product or offering on a performance-based pricing model. Influencers snip and share the link to the Social Market campaign, adding their own message or voice to the post. When followers click on the snipped link, they are taken directly to the product or offer site. Influencers earn commissions on sales from purchases by fans. What content can I promote with Social Market campaigns? You can promote products, subscriptions, app downloads, and any other sales efforts that can be tracked. How is Social Market different from traditional advertising models? 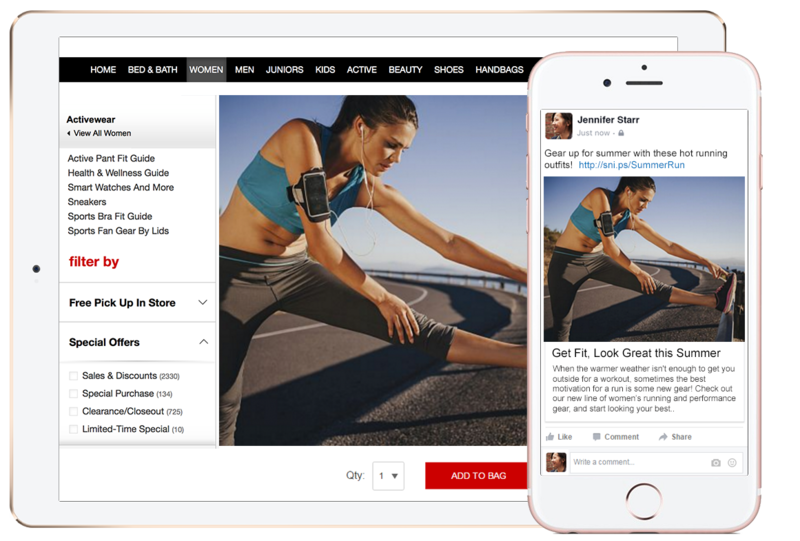 Social Market is a universal advertising platform for promoting products across any social media, like Facebook, Twitter, LinkedIn, or Pinterest. While most social media advertisements operate on an impression model with no garauntee of engagements, Social Market operates entirely on a performance-based cost-per-acquisition (CPA) model, so you only pay for real, quantifialbe results. Social Market campaigns can be limited to specific countries. How are sales and conversion tracked? Conversions and sales are tracked using a Snips tracking pixel, which may be placed on your website's landing page after the completion of a sale. Advanced users can also track conversions through server-to-server communicaion using a postback URL. You cannot select individual influencers for your campaign. However, you may target preferred influencers by category, geo-location, and age range, which helps in promoting your campaigns to the right groups of influencers and their audiences.